Party Lighting will add real atmosphere to any party and gives that real dance party feel. Great party lighting options below... and don't forget to check out our heavily discounted SPECIAL LIGHTING PACKAGE! And ... ask about our ipod option. Available with all our Digital Jukeboxes. All prices are for Overnight Hire and Include GST. All items are delivered with your jukebox. Delivery is free with a Jukebox hire, otherwise a fee will be charged. Want to make your party night one to really remember? Add some effect lights. Choose any four lighting items, any price, and add these to our lighting stand ... and you will receive your lighting stand FREE of charge! This can be up to a $80 saving! This is a terrific option for those homes and venues that can't hang lighting. The stand makes it so easy! The Quiver Ball is easy to set up. Can be put on the floor or table and will give your party an amazing effect, similar to the classic “mirrorball” but no complicated set up. Projects multiple beams of coloured lights. The Magic Jelly is a multi-coloured disco effect light that has rotating beams that change colour and pulse to jukebox sound. It has a rotating head which allows the beams to dance around the room creating fantastic effects. Can be set up on a table or attached to our Lighting Stand. Would be a great inclusion with our Lighting Pack Special. Ever-changing effect light with flowing, razor-sharp beams and a ring of punchy white LEDs. Five separate, synchronized pods create bold effects both in the air and onto any surface. Red, green, blue, white and amber LEDs provide a multitude of colors to achieve a great party look. This light is very popular! 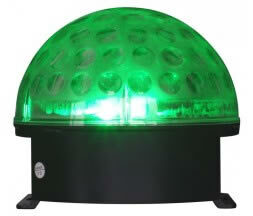 A sound activated effect light with LED clusters that produce various brilliant light beams of different colours. Works really well with the smoke machine too! Music controlled LED light effect that projects 4 bright coloured patterns over a wide area. 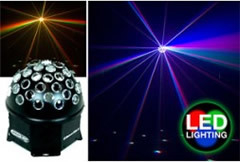 This light is ideal for parties as it covers your jukebox dancefloor and gives a good spread of light beams. The lights pulse to the beat of the music. Looks great when used in conjunction with a smoke machine too. The helious is suitable for our Lighting Pack SPECIAL. The Z Beam effect light combines a mini-strobe and sound activated LED effect lights. 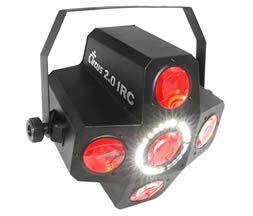 It is compact and creates a dynamic, colourful lighting effect on your dance floor. The LED's ensure an impressive amount of light output and the mini-strobe adds that extra touch. Perfect for our Lighting Pack SPECIAL or any party wanting a colourful lighting effect. Small and Large Mirror balls are available. Includes a motor and two pin-spot lights. All three components need power and the mirrorball needs to be hanging from the ceiling, ideally in the centre of the room, with the two pinspots hanging on opposite sides of the room shining on the mirrorball. If you don't have a ceiling that can attach a mirrorball, you may like to consider our new effect light, the Quiver Ball. 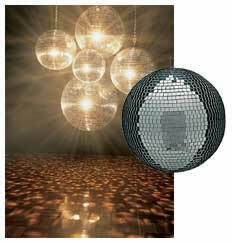 This light gives you a similiar effect as the classic mirrorball with rotating lights. It's easy to set up, just sit it on a table. Lightning quick flashes of white light. 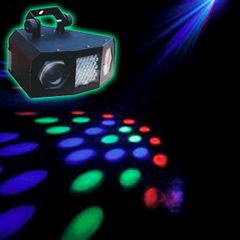 The strobe is popular on the dance floor giving you quite an impressive 'flashing' effect. You can control it's use by using it as an 'effect' during your party. 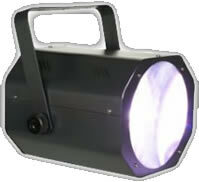 The strobe is suitable for our Lighting Pack SPECIAL. Decorative Fairy Lights. Appoximately 20 metres long. 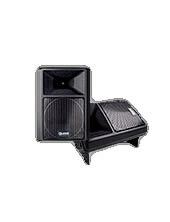 Why not hire a few of these as they add heaps of atmosphere to outside settings. Disco Lights with chaser. Great option for our LIGHTING PACKAGE too! Four (4) colours can be mounted on top of jukebox. They flash to the beat of the music. Simple but effective. Rope Lights - 10 metres in length. Clear plastic tubing with flashing colourful mini lights. UV Lights that make you glow in the dark. Sometimes called Black Lights. Very effective with white clothing and really add a lot of atmosphere. Recommend at least two UV lights for best effect. Our UV light globes come in a UV holder, just plug in to a powerpoint. The Polaris is a great effect light that pulses to the music with rotating multi coloured lights that add a real party atmosphere to the dancefloor. A great option for our Lighting Pack SPECIAL. A great way to display all your lighting. 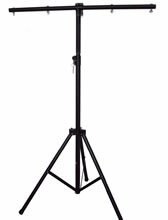 Attach up to four items on our Lighting stand. Hire on it's own or with a selection of our great party lights. You may like to also consider our LIGHTING PACKAGE which includes our Lighting Stand for FREE! Speakers - Two powered Quest 300watt Speakers. Add that extra 'oomph' to your CD jukebox. Note: Digital Touchscreen Jukeboxes have these speakers included. 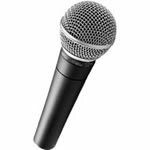 Need to make a speech ... hire one of our microphones. Specially adapted to operate with our jukeboxes. 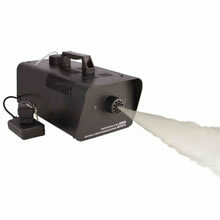 A smoke/fog machine is great fun at any party, especially with effect lights. 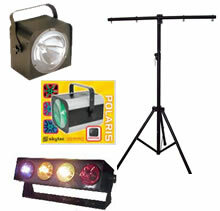 Add any of our effect lights to really liven up the dance floor. Timer button included which controls the amount of smoke/fog during your party. Note: The smoke/fog that is used with the machine is harmless (it is not 'smoke').